Appreciating films made before 1910 can be tricky. Their sets are phony; their pantomime exaggerated and their camerawork, contrastingly static. They’re also really short. Viewed from the distance of a century, they tend to emphasize their own crudeness more than anything else. If silents are ghettoized within the classic film community (and they are), then these films, deficient by almost any standard we now use to judge a film great, are ghettoized within the ghetto. If we assess them as we would any film—ignoring the urge to patronize them as ‘artifacts,’ or the temptation to elevate ourselves by spouting trivia about their production or their status as technical milestones, while ignoring the result onscreen—we’ll conclude that most of them are junk. However, we’ll also find a few gems—films that, in their exceptional beauty, technical excellence, and message, represent true art. With this in mind, deep into paragraph three of my review, I present: Modern Sculptor. Modern Sculptor (Sculpteur moderne) is one of Segundo de Chomón’s many fine works. I confess minimal familiarity with De Chomón and his films; I know he was a Spaniard who worked in France, and his work is often compared to that of the great George Méliès. Readers of Silent Volume know I’m a huge Méliès fan. I think I’m going to be a huge De Chomón fan, too. Modern Sculptor is a five-minute ‘trick’ film—part of a genre already depleted by 1908; born of cinema’s roots in low-brow theatre and magic. It has no more plot or dramatic build than a vaudevillian could provide by spinning plates. Filmmakers in Europe and North America made hundreds of these films, and by the time Modern Sculptor came along, audiences were ready to move on. And Modern Sculptor, by god, knows it. That’s why I love Modern Sculptor. Who is the ‘modern sculptor’? He or she—in this case, she—is an individual who can sculpt hands-free. The process is mysterious, a conjuring as much as a labour. The result, though familiar as any statue you’d see in the gallery, is not fixed. The modern sculpture is more than it appears to be. It’s devious and unpredictable. It may get up and sneak away at any time, as the rigid works of the Ancient Sculptors never could. Anything is possible. Modern Sculptor opens with the properly dressed artist (Julienne Mathieu) presenting her wares to us. (The print I saw, described as ‘stencil-coloured,’ has several hues.) Head held high by justifiable pride and a solid corset, Madame begins her exhibit: Up first, a series of pieces on pedestals, most of them inspired by Classical forms: male dancers in frozen poses; balletic maidens, rotating; wrestlers sparring; be-sworded Roman legionnaires hauling a wounded comrade. De Chomón’s skills are on display here, placing Mathieu in the left foreground while the sculptures—miniatures—occupy the middle. Were they actual miniatures, the film would be boring, but in fact, each figure is portrayed by an actor, caked in white. In some cases, the actors move; in other cases (delightfully) they attempt to be motionless. You don’t know what they’ll do until they do it. Maybe they’ll just stay still. This is sculpture as it can be, in the era of film. In the second part of Modern Sculptor, Madame displays her technique. Or does she? She and her assistant (André Deed) disappear from the frame; only their hands are visible as they place globs of clay on a flat base. Now we’re treated to some stop-motion animation—‘claymation’—as these globs form themselves into, among other things: an eagle with flapping wings (spinning, on its own, to provide us a better view); a baboon smoking a pipe (the smoke is real); a crocodile, whose head and tail invert; and a lion’s head with lapping tongue. 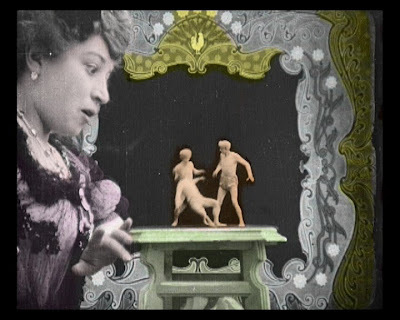 The basic techniques of claymation must have been established by 1908, because the results look perfect here. Only for the final display does Madame step in, and only, really, because she has to. We see a cylinder of clay laid upon the flat surface, cut up (by an invisible blade) like a roll of pork would be cut into medallions. The segments slide one upon the other, stacking upward and forming themselves into the shape of an old woman. She sits in a chair to be admired, an obedient piece of art. Then, she becomes a human figure (in masque, I believe). She begins to scurry away. Mathieu’s hands descend and surround her, squashing her (in the film’s least convincing scene, I’ll admit) back into a lump of clay. This last bit is the real ‘trick’ of Modern Sculptor. It’s a sly aside, a smirking, satirical statement about a medium on the cusp of greatness. Just what exactly are these things, these, movies? What are their fashioners up to and how do they work, such that they leave no trace of anything but the final product? What should we make of these images, nearly as convincing as those we see with our own eyes, but not to be trusted? Perhaps, not easily controlled? These questions aren’t limited to the days before World War I. In our era of digital manipulation and home office post-production, the concerns embedded in Modern Sculptor remain urgent. And that’s part of what differentiates a valuable artifact from a piece of great art, like this one. The former shows us where we’ve been. The latter, where we’ll always be. Modern Sculptor was screened live on March 30, 2011, as part of the Toronto Silent Film Festival. Accompaniment was provided by Bill Lasovich. Thanks for this--it looks lovely. I love the stenciling in early French films. I guess in some ways that was a benefit of the brevity of early film, that they had more freedom to experiment with more labor intensive processes like that. Just wanted to let you know how much I enjoy your blog. It's hard to find people who talk about silent film seriously, on its own terms, rather than the usual, "Well, it's surprisingly not terrible, considering..."
I know exactly what you mean. I'm always pleased when people discover these films for the first time, but when the tone of their reviews are so incredulous, you wonder how they approach other new things in their lives. Thanks for posting, and I'm glad you enjoy my work. I agree with the previous writer's comments; I enjoy reading your blog and your posts are creative, informative and thoughtful. MODERN SCULPTURE looks like a lovely little film and is a new title for me, but my knowledge of French cinema from the silent era to New Wave is limited (I would have mistakenly identified the woman in the film stills as Alice Guy). I recently wrote a brief overview of LE BALLET MECANIQUE (1924) a short by Fernand Léger, Man Ray and Gerald Murphy. I was fascinated by the notion of these (and their fellow) artists as the first cinema generation, but on reflection I might have indulged a bit in “the temptation to elevate ourselves by spouting trivia about their production or their status as technical milestones, while ignoring the result onscreen.” I don’t say this in the spirit of confrontation, but simply to admit that I’m still learning how to write about films with a balance of emotional and intellectual observation. A balance that you have achieved in your writing and for which I admire your film reviews. Thank you for bringing this little gem to our attention. Thanks! I'm glad you enjoyed the piece (and I hope Modern Sculptor will be easier to find soon). I do think historical context is important, and factoids are fun. When I wrote this, I had in mind many snippets of post-movie conversation I heard at a recent classic film fest. Here's one example: when THE WOLF SONG concluded, the first words I heard were from a gentleman explaining that the romantic leads were dating at the time of filming. He didn't say this to explain his opinion of the film's love scenes, or the chemistry of the actors... he just said it to prove he knew it. This gets tiresome. There were serious discussions of the artform going on at that festival (I know, because I was involved in a few). But if people want to sound like DVD liner notes, I'd rather they just gave me the notes, y'know? But all of the examples that I can think of feature a male creator at the helm. I'd be curious if anyone has done work on the gender politics of these reflexive films. That's a really interesting point. I hadn't considered it, and I can't add much in the way of an answer. De Chomon would have known Alice Guy's work before filming Modern Sculptor, since she was directing in France prior to 1908. (Mathieu resembles Guy a little, too). I assume female magicians would have been rare, since they still are. And as for female sculptors, Camille Claudel would have been fairly famous in France by this point, though in decline. It's possible that De Chomon's use of a woman in this film is another satirical tool, if placing a woman in a traditionally male role is symbolic of rapid, uncertain change.